From starring in Spider Man, Milk and 127 Hours, James Franco has quickly become one of Hollywood’s hottest faces (literally and professionally) but his style moment lyes not in playing James Dean in 2001 but as the Face of Gucci’s made-to-measure campaign. All The World’s A Stage campagin kick starts the launch next month, for the first time, of Gucci’s bespoke service and it is Franco who has been chosen as the face of the brand’s latest venture in redefining luxury. 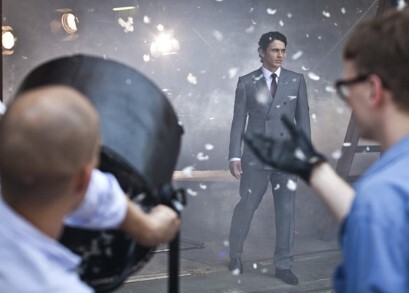 Shot by Nathaniel Goldberg at the Cinecittà film studio in Rome, Franco cuts the cloth in a single bottoned, pinstripe suit (below), a double breasted grey two piece (bottom) and my favourite, a thick 1970s inspired check suit paired with a classic pair of leather horse bit loafers (top). Gucci made-to-measure suits, according to the news today, start at £1,900 – which is not as painful as I frist thought it may be – and will be available in 11 boutiques around the world by the end of 2011 worldwide by the end of the year. Featuring in the flagship European and USA stores (Milan, Rome, London, Paris, New York and Beverly Hills), a few in China and Japan (Tokyo, Hong Kong and Beijing) as well as Sydney, its customers are invited to choose between 178 colours and fabrics combinations, from 82 articles including cashmere and classic wool, to create a suit that fits like a glove, with, of course, added extras on top.